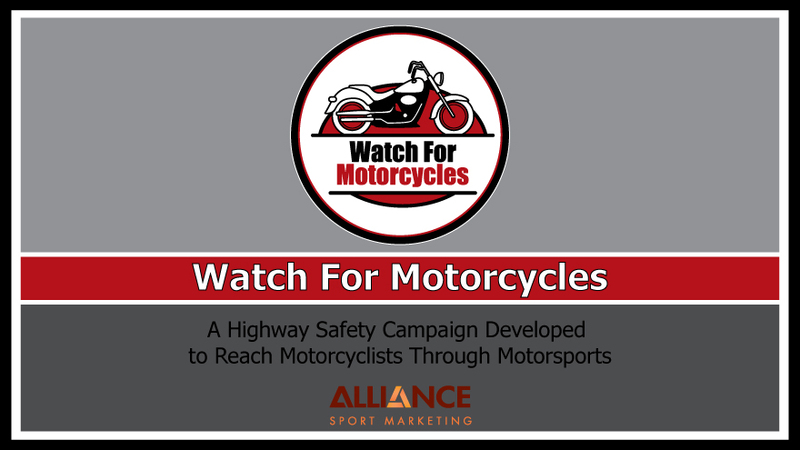 Watch for Motorcycles is a safety campaign developed for state highway safety offices. 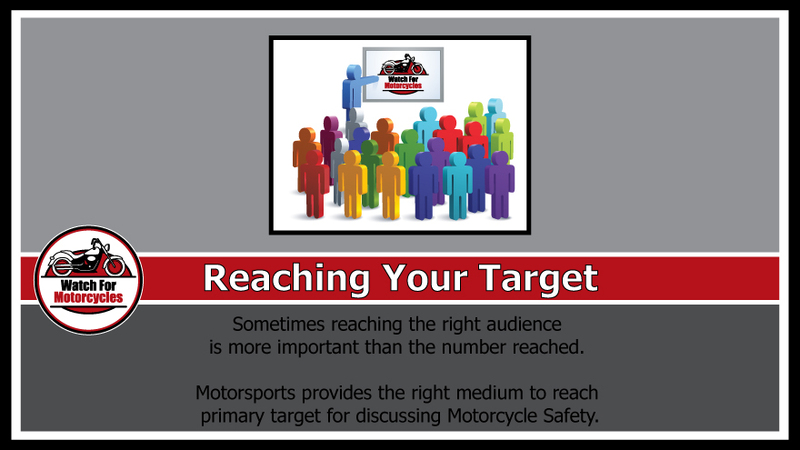 This presentation looks at implementing the campaign through motorsports venues, targeting both motorcycle enthusiasts and non-riders, in an effort to raise awareness for motorcycle safety. Sometimes reaching the right audience is more importnat then the number reached. 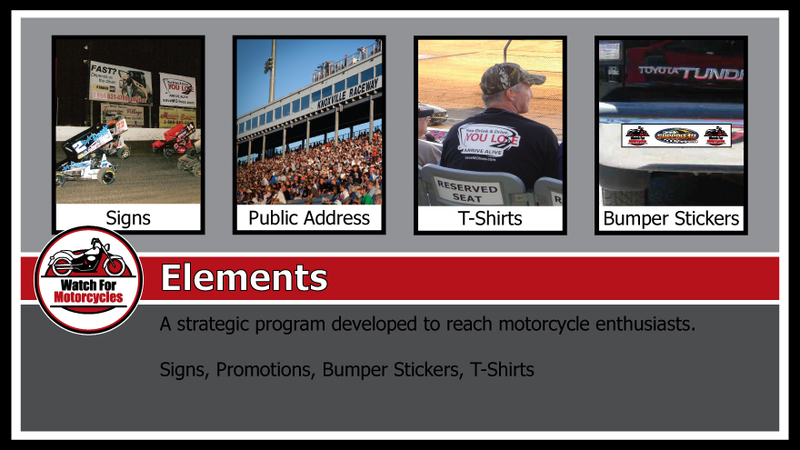 Motorsports provides the right medium to reach the primary target for discussing motorcycle safety. Motorsports fans not only have a higher concentration of motorcycle riders, but also more drivers and riders prone to high risk behaviors. Motorsports fans are more likely to be Motorcycle Enthusiasts than the general population. 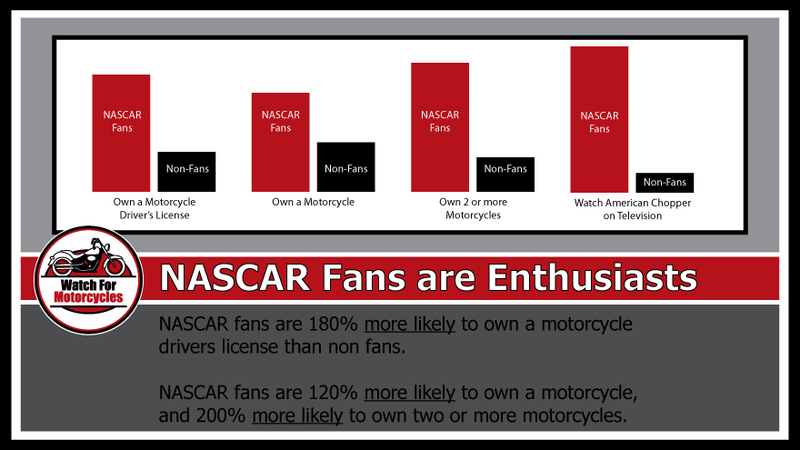 According to research, NASCAR fans are 180% more likely to own a motorcycle license than non-fans. NASCAR fans are also more likely to own one or more motorcycles than non-fans, and NASCAR fans are significantly more likely to watch television shows like American Chopper than non-fans, a key indicator of interest in motorcycles. NASCAR is the premier motorsport in the country, but not the only option. 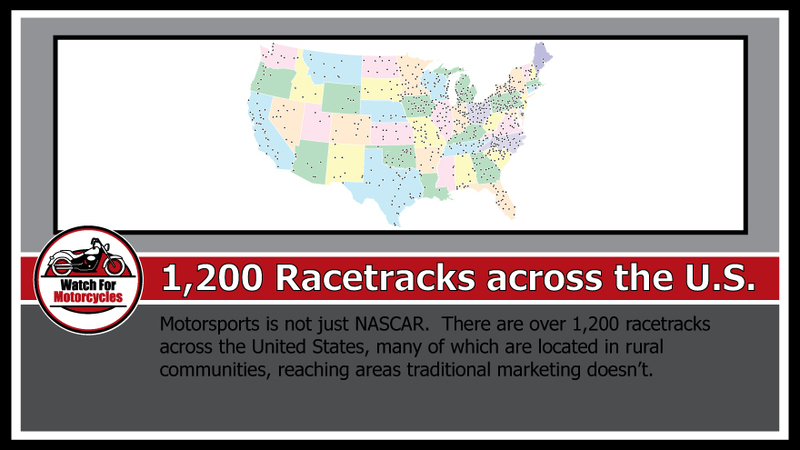 There are over 1,600 motorsports venues across the United States, often reaching into rural communities and areas traditional marketing is unable to reach effectively. 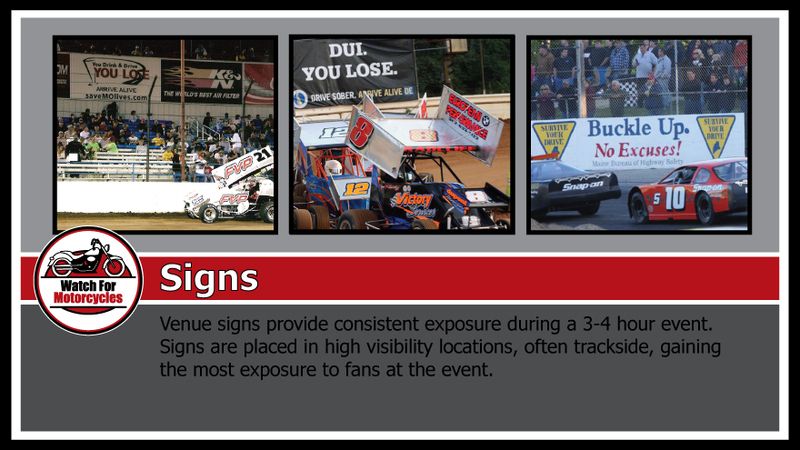 Motorsports venues include paved ovals, dirt tracks, and dragstrips. These venues draw fans nearly every weekend, often between the months of February to November, depending on weather. Watch For Motorcycles logo was developed to be clean, simple, and concise. 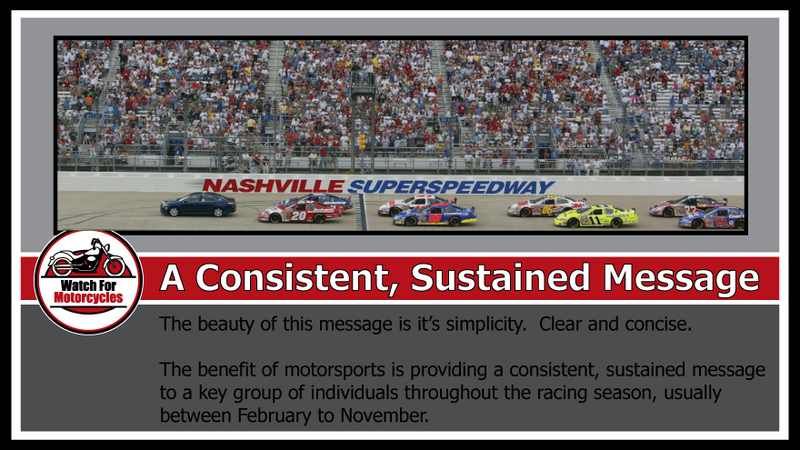 By partnering with motorsports venues, the message can be disceminated throughout the season, providing a consistent and sustained message. Through this, the message has a greater chance of resonating with fans. Elements for this campaign include In-Venue Signage, Public Address Announcements, T-Shirt Promotion, and Bumper Sticker Giveaways. Signs provide premium exposure to fans throughout the event. Signs are placed in high traffic areas, often trackside, seen during the 3-4 hours of the race. Public Address Announcements are read before and/or during an event. 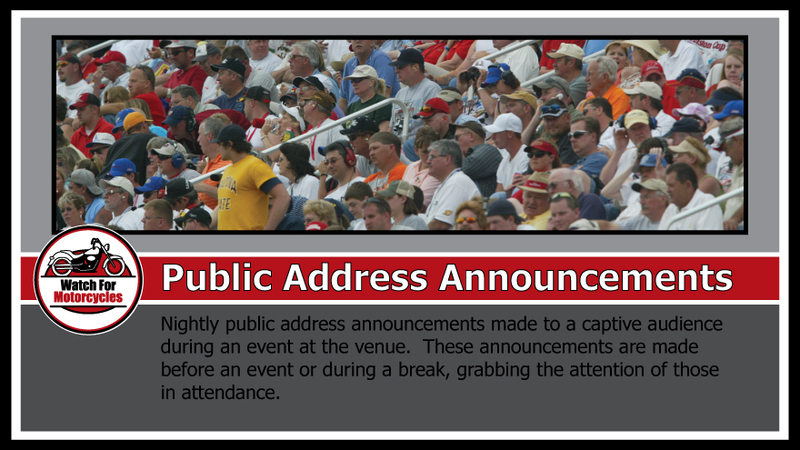 Public Address Announcements are read between the action, and grab the attention of a captive audience in the stands. T-Shirts have a high perceived value and highly sought after during an event. 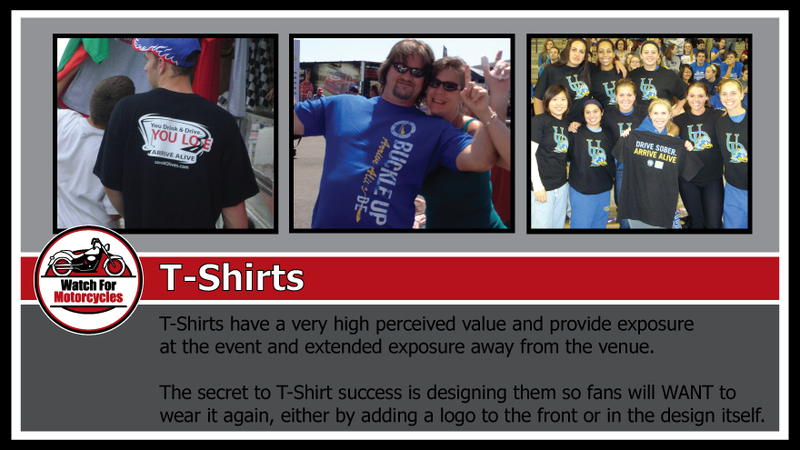 T-Shirts not only provide exposure at the event, but can provide long term exposure from fans wearing them away from the venue in public places. The key to long term exposure is designing the T-Shirts so fans will want to wear and keep them. By attaching a venue logo or cool design to the T-Shirt, along with the safety message, fans are more likely to wear the shirt in other places. Bumper Stickers also provide extended exposure away from the venue. 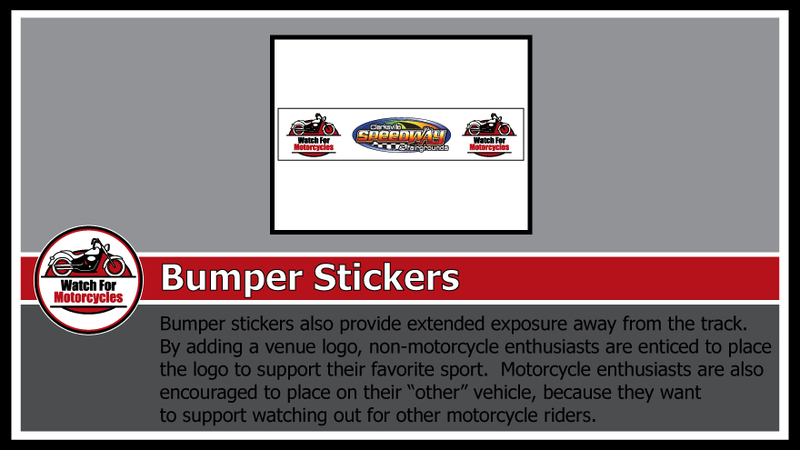 By adding the venue logo, non-motorcycle enthusiasts are more likely to place the sticker on their vehicle, supporting their favorite sport. Motorcycle enthusiasts are more likely to place the sticker on their vehicle because they want to support and encourage safety for other riders. 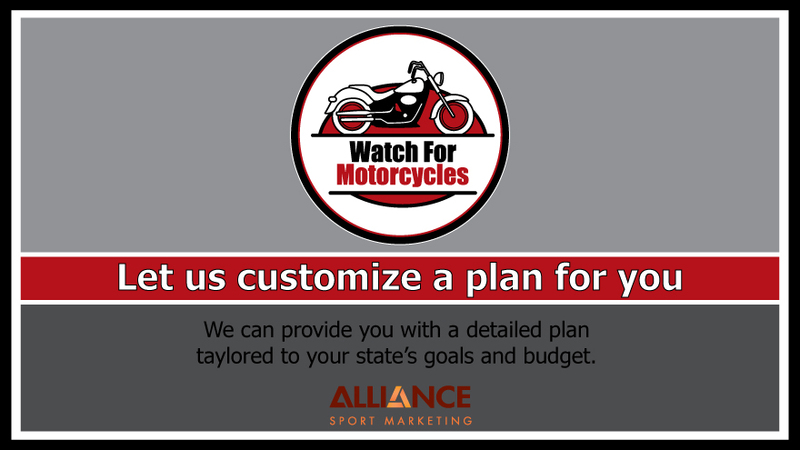 Because each state is different, both with their budget and the number of motorsports venues, a customized action plan can be developed to give you a better idea of what we can offer. Contact us today to discuss and begin planning for the upcoming season.